Illustration of ‘Oumuamua. Credit: NASA. ‘Oumuamua is the first interstellar object astronomers have detected in our solar system. For decades, scientists had been expecting to come across such an object, but it only happened in October 2017, while the Pan-STARRS 1 telescope on Haleakala, Hawaii was surveying near-Earth asteroids. Astronomers tried pointing NASA’s mighty Spitzer Space Telescope onto ‘Oumuamua, however, the comet-like object was too faint to observe directly — but this was a valuable result in and of itself. According to a new study that worked with Spitzer data, previous estimates of ‘Oumuamua’s size have been too generous. In reality, the intriguing cosmic object is much smaller than scientists initially thought. Vents on the surface of the interstellar object probably emit jets of gases, propelling the object slightly. The jets were detected by measuring the position of the object as it passed by Earth in 2017. Credit: NASA/JPL-Caltech. Besides setting new upper and lower boundaries for the size of ‘Oumuamua (pronounced oh MOO-uh MOO-uh, meaning ‘scout’ in Hawaiian), the study also reveals new spicy details about our lone interstellar visitor. One rather amazing finding is that ‘Oumuamua is expelling gas, which acts like a small thruster pushing the small asteroid. This explains the slight changes in speed and direction of the object when scientists tracked it last year. In the months following is discovery, astronomers conducted multiple observations with ground-based telescopes but also using NASA’s Hubble Space Telescope. 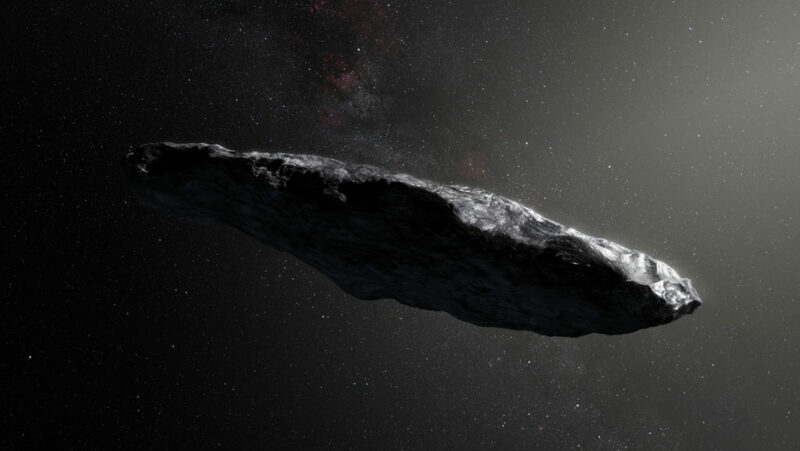 These optical observations reported large variations in brightness, suggesting that ‘Oumuamua has an elongated shape, resembling a cigar, and that it probably measures less than half a mile (800 m) across its longest side. However, Spitzer’s instruments can see things in infrared, meaning it can measure how much heat ‘Oumuamua radiates — and this can be helpful in measuring the object’s size with better accuracy than optical evaluations alone could. By measuring infrared light emitted by an object, scientists can essentially measure temperature which, in turn, can be used to determine the reflectivity of an object’s surface — what’s technically called albedo. The new study estimates what ‘Oumuamua’s diameter would be if it were spherical. Trilling and colleagues used three separate models, each with its own different assumptions about the object’s composition but which only slightly differed from one another, and ultimately came up with three possible diameters for ‘Oumuamua: 1,440 feet (440 meters), 460 feet (140 meters) or even as small as 320 feet (100 meters). Images of an interloper from beyond the solar system as seen on Oct. 27 by the 3.5-meter WIYN Telescope on Kitt Peak, Ariz. Credit: WIYN OBSERVATORY/RALF KOTULLA. The findings suggest that ‘Oumuamua may be up to 10 times more reflective than the comets we can find our solar system. A typical comet will constantly change its albedo as its ice warms and turns into gas during its close approaches to the Sun. However, ‘Oumuamua likely traveled through interstellar space for millions of years before entering our solar system, far from a star’s ‘touch’. Once it actually made it close to the sun, ‘Oumuamua’s surface likely suffered some transformations. For instance, some of the released gas may have covered the surface of the object with ice and snow that increase reflectivity. At the moment, ‘Oumuamua is beyond Saturn’s orbit and is exiting the solar system. But scientists expect other interstellar visitors to follow. In the meantime, data gathered on the asteroid could shed light on how planet form in the solar system.